Today is one of the prettiest days of the Summer 08 so far. I bet I say that almost every day lately. The weather has been great here in the Adirondacks. Today, the sky is Adirondack Blue and the temperature is 60 degrees, with nice low humidity. My commute into the Village of Lake Placid takes me along the Au Sable River, past the ski jumps, with the view of Whiteface Mountain jumping up behind the Au Sable. It was stunning - a real Adirondack eye candy sort of day. I was on my way to work at the Lake Placid office of the Prudential Terry Horrocks Real Estate Agency on Main Street. 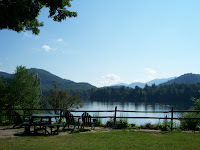 If you are new to my blog, the deal here is I think it is great to live, work and play in a resort town like Lake Placid. So I write about it here and sell you an Adirondack based-business or a piece of property in the Adirondacks here. Things are still busy here in the Adirondacks. Ironman Lake Placid athletes are running, cycling and swimming all around, getting ready for the big day next week on Sunday, July 20th. By the end of the coming week, Lake Placid will be packed full of Ironman competitors and their families. It is a very interesting and fun time. As you can imagine, event day is all about the 2,300 or so athletes and their friends and families. The Village is full of energy. The finish area is a particularly fun place to hang out. If you are planning a trip to Upstate New York and have never seen a live event like Ironman, the village of Lake Placid is worth a stop.